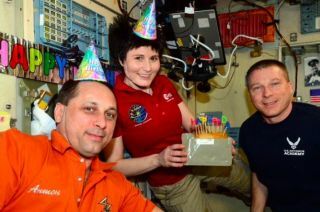 International Space Station crewmembers Anton Shkaplerov (left), Samantha Cristoforetti (center) and Terry Virts (right) celebrate Cristoforetti’s birthday in April 2015. Three astronauts won't be returning to Earth from the International Space Station on Wednesday (May 13) after all. NASA and its international partners have delayed the landing of NASA astronaut Terry Virts, Russian cosmonaut Anton Shkaplerov and the European Space Agency's Samantha Cristoforetti until early June, after learning new details about the recent failure of Russia's robotic Progress 59 cargo spaceship. Cristoforetti wasn't exactly disappointed about the schedule change. "Looks like it's not time to get my spacesuit ready yet... what a present! ‪#MoreTimeInSpace," she said today via her Twitter account, @AstroSamantha. The robotic Progress 59 suffered a serious malfunction shortly after launching, on April 28, toward the space station atop a Russian Soyuz rocket. Engineers were unable to gain control of the spacecraft, and Progress 59 burned up in Earth's atmosphere on the night of May 7. The crew-departure delay is tied to the decision to push back the next manned mission to the International Space Station, from May 26 to late July, NASA officials said. That Soyuz launch, from Baikonur Cosmodrome in the Central Asian nation of Kazakhstan, will loft Kjell Lindgren of NASA, Oleg Kononenko of Roscosmos and Kimiya Yui of the Japan Aerospace Exploration Agency. The "landing delay was made in conjunction with the decision to delay the next crewed Soyuz launch," NASA spokesman Dan Huot, of Johnson Space Center in Houston, told Space.com via email. "This way, we minimize the amount of time only three crew are on board, enabling us to continue the maximum level of science and research on board." There is no danger at the moment that the six people aboard the orbiting lab will run out of food or water; the space station has enough supplies to last until this coming fall, NASA officials said. Virts, Shkaplerov and Cristoforetti arrived at the space station in November. They're currently sharing space with NASA astronaut Scott Kelly and Russian cosmonauts Mikhail Kornienko and Gennady Padalka, who reached the orbiting lab in late March. Kelly and Kornienko will stay aboard the station for nearly a year to help researchers better understand the physiological and psychological effects of long-duration spaceflight. Such information should help pave the way for manned trips to Mars and other distant destinations, NASA officials say. Padalka will live aboard the station for a typical six-month stint. Editor's note: This story was updated at 5:35 p.m. EDT to include a quote from NASA spokesman Dan Huot.